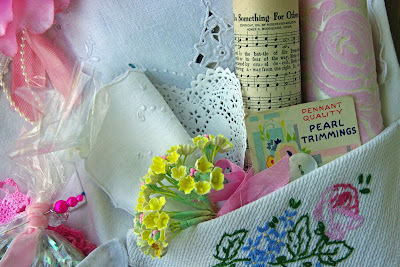 Here is just a sweet peek at my Pretty Pocket Swap that I completed for Sarah of Gypsy Mermaid. It has been so much fun shopping, designing and creating this pocket. I just got it in the mail today, so I can't show too much until she receives it. I hope she likes it! What a beautiful peek! Of course she'll LOVE it! Wow! I can't wait to see it all!